-All but a handful of the hardcovers have been or are being shipped. This means 90% of the hardcover backers should see their copy by mid-May! Thank you for your patience. -The bonus story by Darren Pearce that was promised during the Kickstarter will be released this month. -You still have the rest of the month to get your pitches in for the anthology The Awakened: Isle of Bones. If interested, click here and check it out! -It is my birthday month! So how am I celebrating? By giving away presents to YOU!!! Just go to Goodreads for your chance to win a paperback version of The Awakened: Book I. Here is a great review of the book that was posted over at Roleplayers Chronicle. 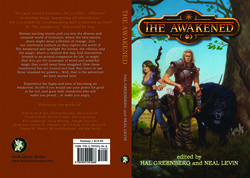 -I am THRILLED to announce the next three cover artists for The Awakened: Books II, III and IV!!! This is all great news and I can’t wait to get more info out as we are allowed! Thank you for your continued support.